Dr. Gopal’s academic interest is in studying acute kidney injury. Acute kidney injury is a common clinical problem and is known to have adverse effects on morbidity and mortality. She is focused in analyzing the long term outcomes and developing protocols to improve the prognosis in patients who have suffered acute kidney injury. Her other academic interest involves developing guidelines for safe use of pain medications (opioids) in patient with chronic kidney disease. 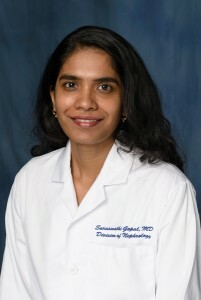 Dr. Gopal has varied clinical interest; she runs the acute kidney injury clinic. She is also takes care of patients with chronic kidney disease including those on those on hemodialysis and peritoneal dialysis and serves as the medical director at the UF Shands outpatient dialysis unit.